SEOUL, Oct. 11 (Yonhap) -- South Korea's industry minister said Thursday the government's renewable energy initiative is in line with inevitable global trends, stressing its role as a "new growth engine" for the national economy. 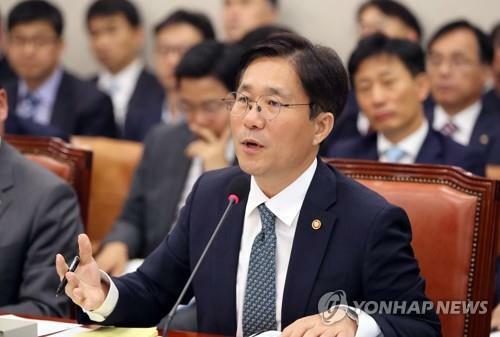 Rejecting lawmakers' skepticism, Sung Yun-mo, minister of trade, industry and energy, advocated the government's energy transformation roadmap, which aims to nearly triple the ratio of renewable energy to 20 percent by 2030. "We have to continue to move toward renewable energy considering the economic situation, public demand and the creation of new growth drivers," Sung said in a parliamentary audit of the government, calling the energy roadmap "feasible." The government has announced a plan to spend 110 trillion won (US$96.1 billion) by the target year to expand its energy capacity from renewable sources to 48.7 gigawatts. In response to rising concerns over the possibility of electricity price hikes and environmental damage from installing solar panels on mountains and rural areas, Sung said the government will carefully look into potential side effects and take necessary measures. "I think any clean energy initiative should be pushed after considering public safety, the prevention of environmental destruction and minimizing conflicts," Sung said. "We have already announced complementary measures that encourage the participation of local residents, but will continue to work on improvements." While opposition lawmakers pointed out various factors that could push up electricity prices under the nuclear phase-out policy, Sung said the government doesn't plan to adjust the rates in the short term. According to the ministry's report, the early closure of the Wolsong-1 reactor was expected to cause an increase of the electricity purchase cost of the state-run Korea Electric Power Corp. (KEPCO) by about 851 billion won by 2022. Also, the scrapping of the construction of six new nuclear reactors would raise the cost by a total of 8.14 trillion won, the report showed.